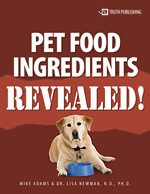 The following list of pet food ingredients and ratings was created by a cooperative effort between pet food formulator Dr. Lisa Newman, N.D., Ph.D. (www.Azmira.com), Mike Adams (www.HealthRanger.org) and the non-profit Consumer Wellness Center (www.ConsumerWellness.org). Mike Adams and the CWC analyzed the ingredients of 448 popular pet food products sold in the United States and organized them by frequency. Dr. Newman then provided a nutritional analysis and comment for each ingredient. 1) Pet food ingredients by rating (from 5 stars down to 1 star, with 5 stars indicating the best quality ingredients). 2) Pet food ingredients by frequency (sorted by how frequently they appear in pet food products, from 96% down to 1%). 3) Pet food ingredients listed alphabetically (to make it easier for you to reference an ingredient you're curious about). 4) Worst pet food ingredients (which lists all the 1-star ingredients, indicating lowest quality).